In 1958, Shu Uemura set forth to revolutionize the world of make-up. For the past 50 years he has striven to reinvent new standards in beauty.Mr. Shu Uemura is recognized around the world as a true master of contemporary beauty. He took a revolutionary path to polarize the art of makeup. With an unwavering passion, he has built a global brand synonymous with artistic expression, purity and quality.In 2013, Shu Uemura Art of Hair was launched in Australia, expanding Mr. Shu Uemura’s mastery of beauty from face to now include hair. 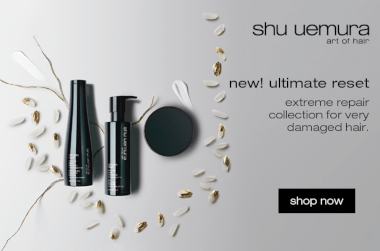 Adore Beauty is an official stockist of Shu Uemura Art of Hair. Free Australian standard shipping. The micro fine spray makes upstyling a dream. Its has excellent hold and is suited to all hair types. This is a must have in my bridal styling kit. Whenever I use the Ultimate Reset range, the scent and results trigger an expensive, salon experience. This range was my first experience with Shu Uemura, and it's definitely worth the price tag. I have been using the Shampoo and Conditioner duo for the last few weeks, along with the serum and mask and my hair feels fuller and smoother. I feel like it actually looks healthier overall, with more shine and bounce. Plus. with the gorgeous packaging, they look so fancy in my bathroom!